As a baseball player, there’s nothing better than reaching September 1 and knowing every game counts. You’re lucky enough not to be on a team so far back in the standings that you’re just sitting in front of your locker and scheduling the moving van and planning vacation. You’re still in the battle, moving closer every day to securing a spot in the post-season. To win the World Series. Obviously, we have to win the division first, then the League Championship. We know every single pitch, every single inning, every single game is huge at this point. We can’t give up anything. We have to have our A game every day. For me, the most fun I have is working with the pitchers on this team. This is an amazing staff. C.J. is incredible. That’s the only word. He’s spotting the ball so well. He can get a hitter out with any pitch he wants. He’s very focused and gets himself very prepared for every game. I’ve been asked if it’s different for me catching a very young pitcher vs. a veteran pitcher. The answer is yes and no. The bottom line is that your job as a catcher is to help the pitcher get the hitter out with whatever pitches he has. I ask pitchers what their best two pitches are. I do my homework on each pitcher – what he likes to throw in certain situations. But with a rookie, there are times I catch him for the first time when he enters a game – which happened with Michael Kirkman during a game in Baltimore. I had never even caught him in the bullpen. I walked to the mound and asked him for his two best pitches. He said fastball in and out and slider. OK. Great. Then I had to pray that he actually threw what I called – that a fastball away was going to be a fastball away. Of course, he’s a terrific young pitcher and he was amazing that game. Something else with young pitchers. They know I’m a veteran, so they’re going to trust what I call. They going to go with whatever I say. So if I’m not completely prepared, I can destroy them. I take their trust in me very seriously. On another note, I’m asking for a favor. I just came from the doctor’s office with Jamie. She’s been undergoing tests for the past few weeks, and the doctor is saying she might have a tumor on her liver. The latest test results should be back later today or tomorrow. Please say a prayer. Thanks. I wrote a blog for almost three seasons in San Francisco and loved the connection it gave me with the fans. So I’m looking forward to getting to know Rangers fans through these posts and also, I hope, to giving you a glimpse into what it’s like to be a major-league player. To be honest, it’s a real blow to be traded. I loved the players and staff at the Giants, so to suddenly find myself off the team, it’s kind of a shock to the system. You’re leaving a group of guys, and an entire organization, that you know inside and out. And you don’t know what it’s going to be like on your new team. You have to learn new routines, get to know the coaches and training staff and, as a catcher, I have to quickly get to know my pitchers. Well, I have to tell you, everyone here has been unbelievable. These are very, very nice people. They have made me feel a part of the team right from the first minute. Michael Young texted me right away, before I even arrived, to welcome me and say he was excited about me joining the team. My first day with the team, there was a rain delay and the game didn’t start until 9:30, so I had a lot of time to meet everyone and start to get to know them. Another thing that has helped is that the Rangers have meetings every day to go over opposing hitters and opposing pitchers. This helps me a lot because I’ve been in the NL and don’t know the AL players very well. Maybe the biggest help of all has been Matt Treanor. I wasn’t sure if it would be awkward because I’m coming in to play the same position. You feel like you’re intruding at first so you kind of just look around and try to figure out what’s going on. But Matt came right up to me and started talking about the pitchers. He gave me the whole scoop on each guy, what to look for, what each guy’s tendencies are. I can’t tell you how impressed I’ve been with that guy. But I know that you can’t really know a pitcher until you actually catch him. So I’ve been learning what works for each guy, how they are when they need a big pitch, what they need when they get a little rattled. I have to say this staff is easy to catch. They’re really open-minded and get right down to work. Real pros. Here’s one funny thing that happened. One of the clubbies picked me up at my hotel on my first day here. He knew my uniform number was 1 with the Angels and Giants. He asked if I wanted the same number with the Rangers. “Doesn’t Elvis Andrus wear No. 1?” I asked. “He’s a rookie!” the clubbie said. The clubbie said he had number 11 available. Number 11 happens to be the number on the first uniform my father ever gave me. (One thing you’ll get to know about me is how important my father was in my life, as he was in the lives of my two brothers, Yadier and Jose. He died suddenly almost two years ago and not a day goes by that I don’t think about him.) Anyway, I think I was five or six years old when he gave me that uniform with the number 11 on it. It became my favorite number – and the number I wore every year until I was 17. So it feels good to be wearing it again. Thanks so much for the warm welcome all of you have given me. I know I’ve got to start hitting. I’m seeing the ball well and swinging well, so I know it will come. My wife, Jamie, and our baby, Jayda, are now settled in the house we rented just five minutes from the park. (Jayda, who turned 1 earlier this month, just started walking!) My mother and aunt have also been here from Puerto Rico to help us get settled. And my two daughters from Yuma have been here, too. So it already feels like home. Please feel free to leave comments or ask questions. Thanks again for all the kind words and cheers. I am so excited and grateful to be here with the Rangers. This is a very, very talented team that is going to be fun to watch right through October! most of us never thought possible for ourselves. huge loss for her, too. on the Giants. I have loved playing in front of the fans in San Francisco. what happened?” I asked, but he didn’t answer. you going to be OK? I’m sorry, man. I’m so sorry,” he said. still didn’t know what he was talking about. traded for a relief pitcher and a player to be named later. heading to the hotel, I stood up in the aisle and faced the team. clapped some more. It was an amazing feeling. training room, the Giants staff and all the coaches. They are great people. for reading this over the past few seasons. I hope our paths cross again. When I was growing up, respect was the most important thing to my father. That’s what he talked about every day to me, Jose and Yadier. You play the game with respect, yes — but it’s not only about the game. You respect your parents and your teachers and your fellow human beings. That’s why ESPN’s sarcastic depiction of me running in slow motion down third base and getting thrown out at home in the Marlins’ game was hard to take. I appreciated Henry Schulman’s blog entry about it. Until recently, I had thought of ESPN as a network run by professionals who know sports. I thought the people at ESPN, because they focus only on sports, actually understood the game and what pro athletes do to reach the highest level of their sport. In that Marlins game, which we won, Nate Schierholtz went three-for-three with his first home run of the season. Matt Cain pitched six innings of no-hit ball. And the one highlight ESPN shows of that game is me getting thrown out at home? And they’re doing it just for laughs? Look, you can say I’m the slowest guy in baseball or in all of sports or in the entire world. I don’t take issue with that because I AM the slowest guy. I have always been the slowest guy. I can’t challenge that criticism. But ESPN’s intention was not to criticize but to humiliate. I take what I do very seriously, which is why – despite my obvious lack of speed – I have managed to play in the major leagues for 11 seasons. I play hard. I play hurt. I respect the game, my teammates, the press, the fans. That’s how I was raised. It was the No. 1 thing. I know I’m a public figure and I just have to take my lumps. But I would like those people at ESPN who, from a safe distance, make fun of players for a cheap laugh, to remember that players are actual people. With wives and mothers and fathers and children and brothers and sisters. My mother saw the clip. She doesn’t speak English so she asked Yadier’s wife what the announcer was saying. Yadier’s wife didn’t want to tell her. My mom was pretty upset. She didn’t understand why they were making fun of my running when there are so many other things I do every day to help the team win. I told her I didn’t understand it, either. All I can do is play the way I always have – with respect and professionalism. It’s shame that ESPN, a once great network, won’t have any idea what I’m talking about. Great to have an off day today before starting a road trip against the Marlins tomorrow. I didn’t fly on the team plane last night because I wanted to go with Jamie to the pediatrician this morning for Jayda’s vaccination shot. Even though you know the shot is for something good, it’s hard to watch your baby in pain for any reason. So I wanted to be there for Jamie. The three of us flew out this morning to Florida to meet up with the team. I like Jamie and Jayda to be with me as much as they can, so they go on a lot of the road trips. We go from Florida to New York, where I have a lot of relatives. It will be great to introduce them to Jayda. I was looking at my numbers the other day. Last year at around this time I was batting .304 and hadn’t had a walk. Right now I’m batting .343 overall (second highest among all NL catchers) and .439 at home (second highest among all NL players). And I already have six walks. I’m way more relaxed this season. I’m not putting so much pressure on myself. This is probably my last year in baseball. I am not expecting any clubs to sign me in the off-season – if only the Mets and Giants were interested last year, when I was coming off five straight good years, I can’t expect I’ll have any interest after this season, no matter how well I do. So that takes the pressure off to produce big numbers because, as I have found out, numbers don’t seem to make a difference in the marketplace. The Giants signed other guys to beef up the offense, which means the responsibility isn’t squarely on my shoulders anymore. Therefore I’m not pressing as much. This has translated into being more patient at the plate. I’m swinging at first pitches only 11.8% of time this season, compared to 39.4% in 2009 and 31.1% over my career. It’s funny because I thought I’d feel more pressure in thinking that this is probably my last year. But I’ve done everything I’ve wanted to do in baseball, except be an All-Star. So I’m appreciating everything around me and having more fun. I’m just thinking about today and the guys who are around me in the clubhouse today. I am enjoying, as I always have, teaching the young guys about the game. I’m enjoying getting the most out of each pitcher’s outing. I am enjoying it all – maybe because I don’t have anything left to prove. The only thing that matters is winning. And that’s something that happens as a team, all of us contributing everything we can. I am so happy that, if this is my last season, I’m spending it in San Francisco with the Giants. I said this before and it becomes clearer to me every day: There is something special about this group this season. I feel it in the same way I felt it in 2002 with the Angels. Thanks for reading and thanks for being there for me and the Giants through all the ups and downs. Spring training is a time not just to get yourself ready for the season but also to get your arsenal ready. That means choosing and stocking the equipment you’ll need for the season. During our weeks here, manufacturers of gloves and bats set up tables and show us their latest models and take our orders. It’s fun to see what might be new and different, but usually we stick with what has worked for us in the past. Let’s talk about bats. How does a player choose a bat? Part of the answer is the same as it was in Little League: How it feels in your hands. If you have big hands, you want a thicker handle. If you have smaller hands, like I do, you want a narrower handle. Then it’s about weight and length. I have a bat from Pablo in my locker right now. It has a nice narrow handle, which feels good in my hands. But it’s too long for me – 35 inches. I have a long, sweeping swing, so I need a shorter bat to get around quickly enough on the pitch. Pablo has a short, compact swing, so he can get away with a longer bat. Over the years, I have narrowed my arsenal of bats to three models: Two are from Louisville Slugger – the I13 and the T141, and one is from Sam Bat, the AS12. These are the three that are always in my locker. The I13 is my favorite. It feels the most balanced and streamlined to me. My bats are 33.5 inches long and 34 ounces, though I also order some 32-ounce bats, too. Sometimes if I wake up and I’m kind of tight or tired, or if the pitcher is throwing 100 mph, I might want a lighter bat. All of my bats are maple, which is a bit harder than ash. The ball goes farther, or at least it feels that way. It doesn’t mean the maple gets you a better hit, but when you hit it, you really feel like you hit it. I know I’m two weeks late in posting my first spring entry. I’m trying something new. I’ll still write, but I’ll also be posting video with the blog. The reason this is late is that I’m still figuring out, with my collaborator, Joan Ryan, how to transfer the video from a digital Panasonic to the IBook computer, convert the video to the right format, edit it on I Movie and send it to the Giants’ website folks. So when you watch this video, keep in mind it was shot last Tuesday, on the day position players reported. 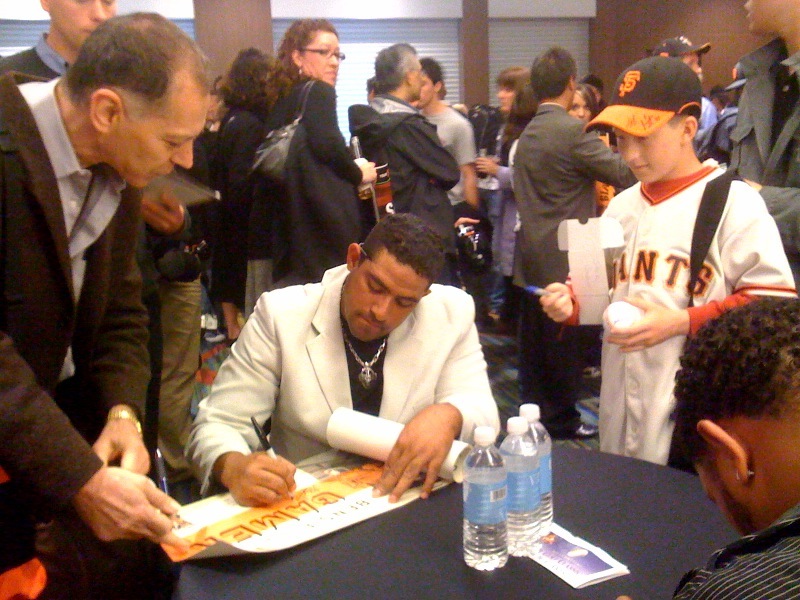 At that time, I hadn’t really met some of the new guys, like Aubrey Huff or Mark DeRosa. It’s been great seeing my teammates from last year, especially the young guys like Pablo Sandoval. They bring so much energy to the clubhouse and they make you remember what it was like in the early days, when everything – from the custom uniforms to a real-life cook in the dining room making eggs for you first thing in the morning – seemed like you had died and gone to heaven. I still feel that way most days, but it’s good to be reminded. Jamie, Jayda and I are in the same house in Scottsdale that we have rented for the last few years. It’s where Jamie and I had our wedding last February 14. We had just a few people at the outdoor ceremony – no one from Puerto Rico was able to come – but it was a perfect day. Now, a year later, that house is filled with the babbling and laughter of Jayda, who is truly the happiest baby on earth. Jamie had surgery on her wrist, which then became infected, so we have my cousin, Jennifer, from Brooklyn staying with us until Jamie can lift the baby again. It’s killing Jamie to have to be so careful with her arm, but she’s already had too many setbacks with it to take any more risks with the healing process. Hope you like the video. Don’t expect too much. We’re still experimenting. But please let me know what you think. And give me your ideas on what you’d like me to talk about on the video. Maybe we can pull some teammates into the next one . . .